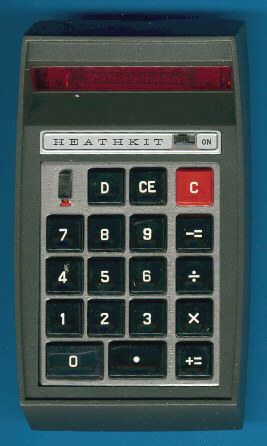 Size: 5.5" x 3.8" x 1.7"
At first glance this early kit calculator sold by Heathkit looks like a Bowmar 901B. To stop any discussions about the source of this wonderful early IC-2009 we should explore the internal construction. Dismantling the calculator is pretty easy - memorize that it was sold as a do-it-yourself kit between December 1972 and May 1974. The priced of the IC-2009 dropped down to $89.95 before the calculator was replaced with the IC-2006. The IC-2006 uses a much smaller housing with a complete different design. © Joerg Woerner, September 28, 2003. No reprints without written permission.